This is a delicious way to use up leftovers from a Sunday roast. What makes the dish Nordic is the essential addition of pickled, sliced beetroot and fried eggs, giving it a satisfying sharpness as well as an instant sauce from the runny yolk. 1 .Preheat the oven to 140˚C, gas mark 1. Heat the butter and 1 tbsp oil in a deep frying pan, add the potatoes and fry over a medium-high heat, turning carefully, until golden and crisp; set aside. Add another 1 tbsp oil to the pan and cook the onion and bacon for about 5-7 minutes, until golden, then add the cooked meat to heat through. Stir in the kale and once slightly wilted, carefully fold in the potatoes again – you want them to keep their shape and not turn to mush. Season; add the chopped parsley, then transfer to the oven to keep warm while you cook the eggs. 2. Fry the eggs in a pan in a little more oil. 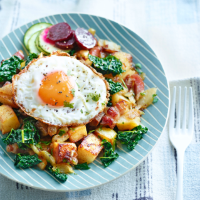 Serve each portion topped with a fried egg and splash of Worcestershire sauce, with some sliced pickled beetroot and cucumber alongside.